Jeep Wrangler sales became so hot, FCA started running the plant virtually round the clock. So UAW Local 12, which represents workers at the Toledo plant, pushed for a flexible system under which workers could choose to work between four and seven days per week — a first for any FCA plant. TOLEDO, Ohio — Lots of workplaces have a hot seat. At the Jeep assembly plant here, there is a "sweet seat." In the production line where Jeep Wrangler SUVs are made at the rate of about one a minute, a panel must be screwed into the bottom of the vehicle. It used to be back-breaking work for two union members to carry the panel and screw it on as the vehicle moved down the line. Occasionally, they would miss screws. Now two workers sit comfortably on adjacent chairs that follow the vehicle. Lasers point out where the screws go, reducing errors. What is remarkable about the so-called "sweet seat" at Fiat Chrysler Automobiles' Toledo plant is that like many other innovations here, it originated with UAW members on the factory floor. Production workers here create proposals to simplify tasks that are "too heavy or too hard," said millwright Greg Harman, who is on a team of 10 UAW workers that implements those ideas. A handful of automakers have adopted aspects of a similar system, pioneered by Toyota Motor Corp. The uncommon level of union collaboration with Fiat Chrysler management in Toledo offers a road map for union negotiations this summer with FCA, General Motors and Ford Motor Co. According to officials at the automakers, their key focus in this year's contract talks will be on productivity and profitability in the face of an anticipated downturn in vehicle sales and nonunionized competition from the likes of Toyota, Nissan Motor Co. and Volkswagen Group. That clashes with union demands to maintain health care benefits and boost job security, and comes on the heels of GM's warning that it could shutter a car factory in Lordstown, Ohio, along with three other UAW-represented plants. GM'S move drew harsh criticism from President Donald Trump, and prompted the UAW's new president to bulk up the strike fund — serving notice the union is not afraid of a fight over jobs. At a time when national UAW membership fell 8 percent in 2018 after rising for nine consecutive years, and has failed this century to organize a single U.S. assembly plant owned by a European or Asian automaker, FCA's Toledo plant has more than tripled its work force to 5,700 workers since 2009. The biggest reason: Americans' love with the Wrangler and other high-margin utilities. The Wrangler became so hot that FCA started running the plant virtually round the clock. So UAW Local 12, which represents workers at the Toledo plant, pushed for a flexible system under which workers could choose to work between four and seven days per week — a first for any FCA plant. Temporary workers fill in the gaps, and Local 12 sought more protections for those workers, including providing a clear path to full-time employment status. "Our members went way, way, way beyond the call of duty to provide what the company's needs were," said Mark Epley, the plant's union chairman. "It's a competitive market out there and we know that any plant can be taken away at any time." Thanks largely to its success at FCA, UAW Local 12 has hit a 40-year high in membership through organizing workers at many other companies in the area, including a Dana Inc. plant where workers make Wrangler axles. Success at Toledo took years to build. A decade ago, when the former Chrysler Corp was going through its government-funded bankruptcy, Toledo had a reputation as the automaker's worst-run plant. As Italian automaker Fiat took control of the Chrysler, then-CEO Sergio Marchionne turned to Fiat executive Mauro Pino with a challenge: which legacy U.S. Chrysler plant should they use as a proving ground for what Fiat called "World Class Manufacturing," a version of Toyota's lean production strategy but adapted to the Italian automaker's culture? Pino chose Toledo with the idea of turning the worst-performing plant into the best. He had two years to prove he could turn the plant around, he told Reuters in an interview outside Cleveland, where he now runs an Eaton Corp. aircraft parts plant. Pino found a work force of around 1,700 people, demoralized by Chrysler's bankruptcy. The plant produced just over 140,000 vehicles in 2009. He began working to win the workers' trust. He dressed as Santa Claus before Christmas 2010 and handed out candy canes to workers on the line, greeting each by name, workers at the plant recall. Pino also pushed for more productivity but did so by asking workers how they would redesign their own cumbersome jobs. "Usually you need to convince people to change, but when they saw what we were doing they started coming to us," he said. "The new system gave everyone a voice," said Cheryl Reash, a 36-year worker at the plant. Tracy Seymour, also at the plant nearly 36 years, said the team of 10 millwrights — a team started by Pino — came up with a system for parts kits that eliminated the need for vast amounts of inventory on the line. That made it possible for workers to build 10 different engine types without having to bend over, lift heavy objects or walk off the line in search of parts. "I wouldn't run without their equipment," Seymour said. "It would be impossible." Over time, workers and managers at Toledo worked to unplug bottlenecks up and down the assembly line. "Why we succeed and exceed is that union and management came together," Seymour said. Soaring customer demand for sport utility vehicles also helped the Toledo plant. 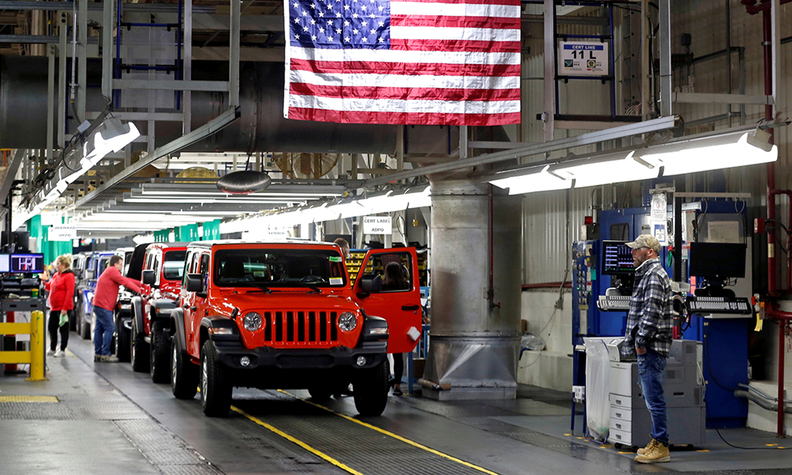 As workers cranked out around 500,000 Wrangler and Jeep Cherokee SUVs annually from 2014 to 2016, the plant's two production lines began running at well over 100 percent capacity, according to data from AutoForecast Solutions. This level of capacity utilization is rare in the industry. Still, FCA could not keep up with demand in both the United States and in the 105 countries where the Toledo-made Wrangler is sold. To ease the crunch, the company proposed moving the Cherokee to another factory so Toledo could make more Wranglers. In return, Local 12 was promised another new product. Baumhower said the local accepted the move based on that promise. The plant is now ramping up production of the Gladiator pickup, which shares many parts with the Wrangler and is getting glowing reviews in the automotive media. But while FCA's Toledo success shows what can happen when a Detroit automaker and its union work together, it also shows how a strong local can also punch back. In February 2018, for instance, Local 12 publicly protested an FCA plan to replace 88 UAW-represented truck drivers with contractors, forcing the company to back down. "We're good at getting along if you want to get along," said Bruce Baumhower, who has been president of Local 12 for 26 years. "And we can fight all day if you want to pick a fight."